I know the background is not perfect, but I gave the galaxy background a try and really like doing it. It is the water colour version, because I had no fitting colours for the distress inks. Afterwards I used some black and white acrylic paint to add the stars and some extra dimension to the background. Back to the beginning. 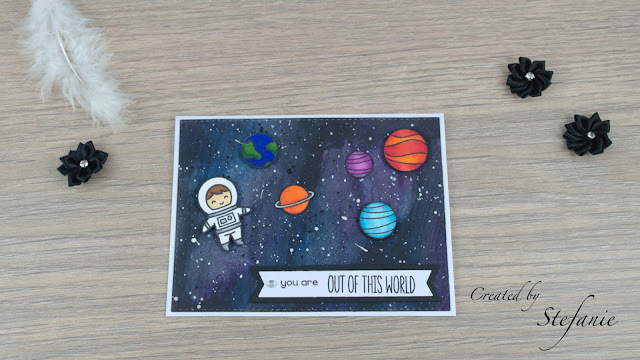 I used the Lawn Fawn stamp set "Out of this World" and coloured everything in with my Copics. Just kept it simple. noting fancy. Can't decide if I want to add some white gel pen highlights. But at the moment I like it like it is. So, since I was out of high school, I never ever touched my water colours again. So this one wasn't not only about a new techniques but my fear of art class as well :D. So I guess this made it fit for the Lawn Fawn Challenge. The blue-ish background is for the B in the All Sorts Challenge. A real fun card and perfect for our 'I spy' theme at Allsorts, many thanks for joining in. Also B for Boy, super background and lovely images. Thank you for joining our 'I Spy' challenge this week at Allsorts. 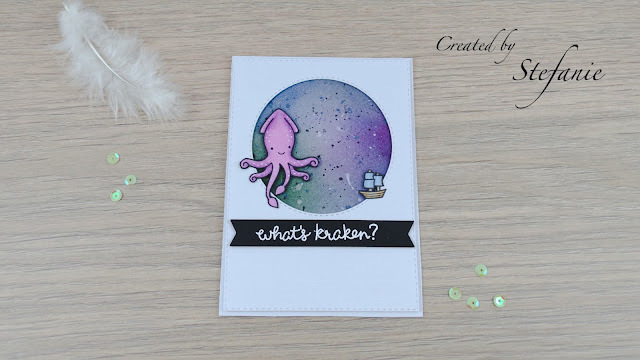 Love the beautiful watercolor background, this is such a fun card design! Thanks so much for sharing with us at Lawn Fawnatics!